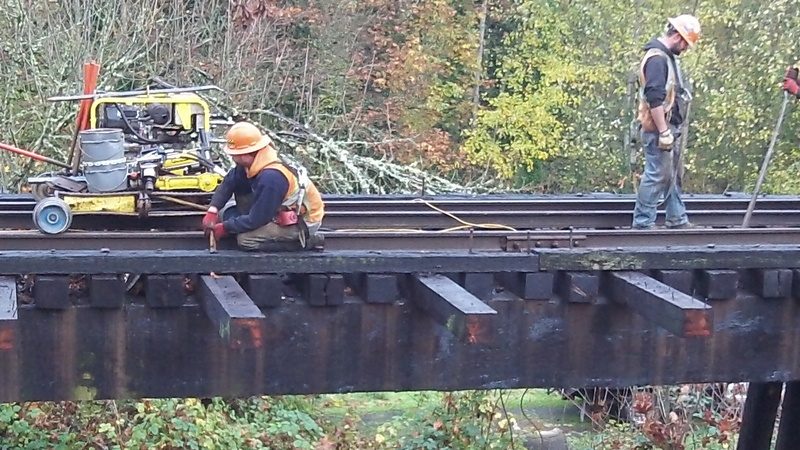 Workers on the trestle, as seen from the hospital parking lot Wednesday. 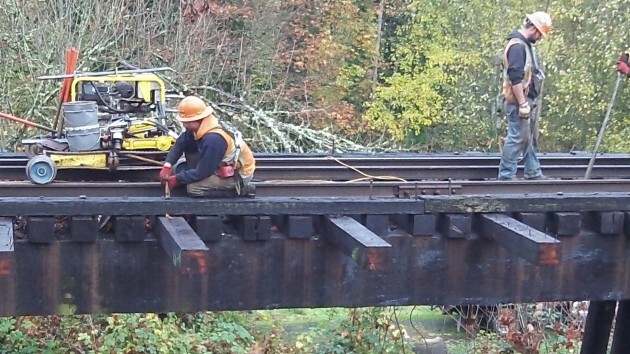 Keeping a rail line in working order is a job that never ends. 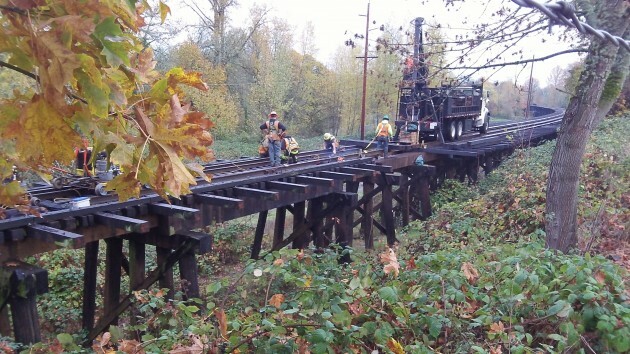 So the Portland & Western does frequent maintenance and repair work on the old Oregon Electric line that runs through Albany. Just now, a crew has been working on the trestle that carries the track along the flood channel of the Calapooia River north of the Albany General Hospital parking lot. From the looks of it Wednesday, the crew was taking out old crossties and replacing them with new and (apparently) longer ones. I left a message with someone at PNWR headquarters in Salem to find out more, but so far I’ve had no callback. 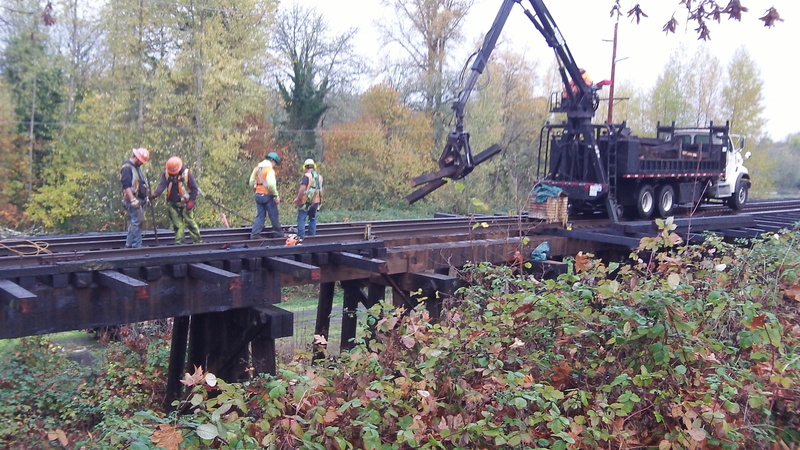 The railroad leases the historic line from the BNSF. It runs from Albany south to Eugene and north past Millersburg to Salem and beyond. Within the last couple of years, the railroad has improved or repaired grade crossings on the line in the Albany area and placed new ballast. Union Pacific is also doing some work at the end of Salem Road where the flashing red light reminds us to be cautious. Quite a distraction with all the workers, their many parked vehicles, a giant crane, other equipment, flaggers and the heavy traffic of an ordinary day. I am always extra careful at that T intersection but have been taking a few more seconds unless the flaggers are directing things. You might be interested in checking it out and also the progress of the demolition of the paper mill.